Pictures from the Kettle Valley Rail Trail 2015. This is the whole of the Rail Trail but due to wild fires at Rock Creek we had to start at Beaverdell. Zack's at Beaverdell; tenting or rooms, hot showers. C-store in town along with pizza/ ice cream place. The trail runs for a lot of time through pine forests which provide welcome shade. Cattle roam free on a lot of the trail. Gazebos are few and far between but very welcome rest stops. The trail is part of the Trans Canada Trail which one day will cross the whole country. Sunset at Hydraulic Lake campsite by the lake. Very basic camping with no tap water, washing in the lake and pit toilets. 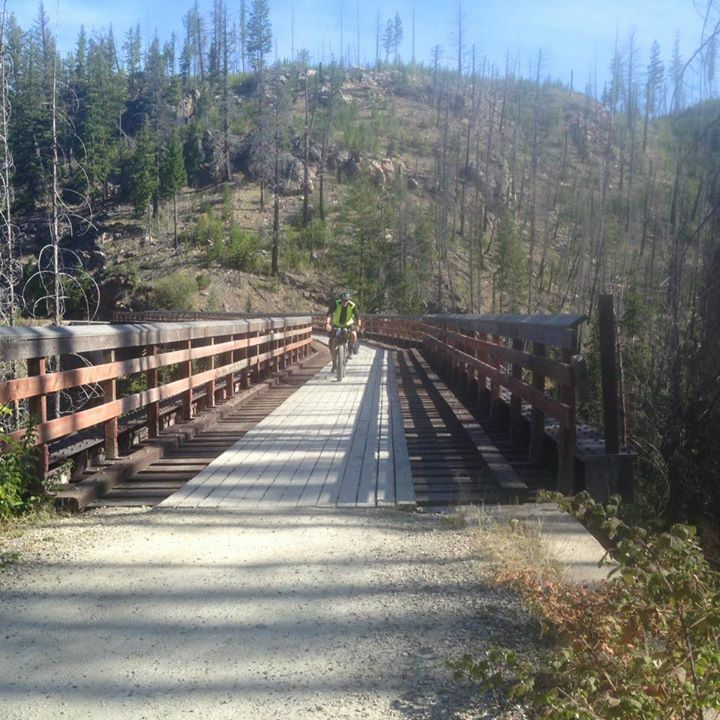 Trestle bridge at Myra Canyon, one of the most popular parts of the trail with bike rental available for the casual visitor. Tunnels and trestles for about 13 kilometres at Myra Canyon. The trail dates from 1915 and is an engineering marvel. All the bridges at Myra Canyon burned in a 2003 wildfire and were rebuilt to original plans by 2008. Drinking water was a problem with not many refill places. I carried 4 bottles on the bike and two in the panniers. The trail runs high above Kelowna and Lake Okanagan. Going down to Kelowna for supplies is a full days hard work. Chute Lake is at the highest point of the route and has a camping resort. Gradient on the trail is a maximum of 2.5%; so not too difficult for trains or bicycles. Rattlesnakes sometimes sit on the trail and nearly get run over. 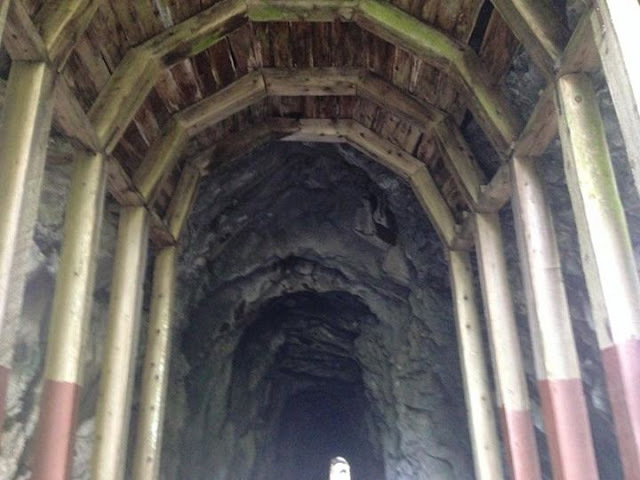 Adra Spiral Tunnel, above Naramata, is where the track did an underground U-turn. The trail gradually descends to the level of Lake Okanagan. 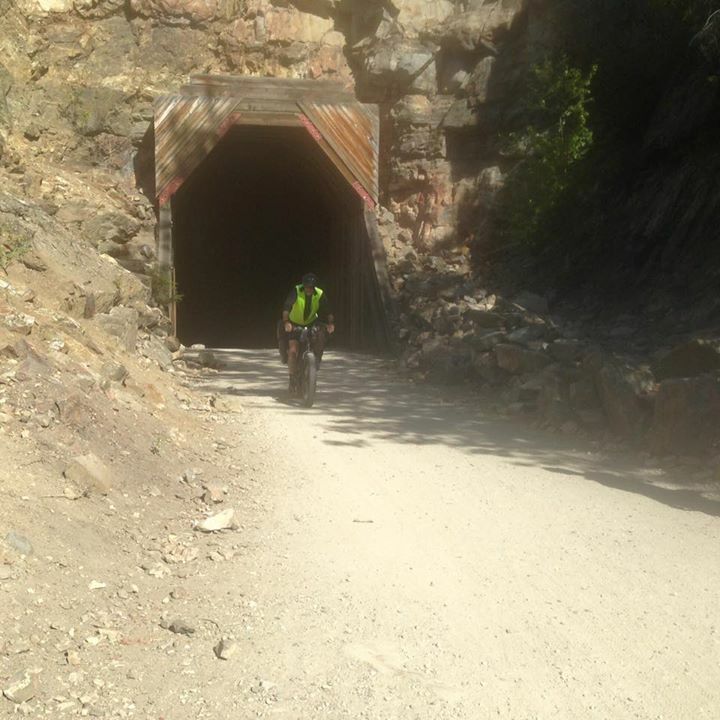 From the Little Tunnel down to Penticton the trail is well surfaced with many more cyclists and walkers. Grape growing and wine-making are major occupations on the hillsides in the Okanagan Valley. Summerland is the only place left where the rails are still in place. There is a short section of track for a heritage rail society to play trains. Just the one flat tyre during the trip and that was because I over inflated the rear tyre in an effort to reduce rolling resistance. The tyre popped off the rim and the tube split with a mighty bang. 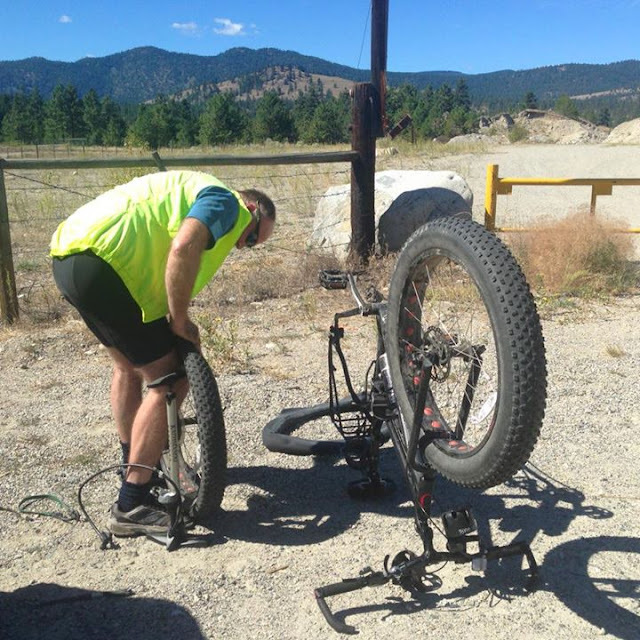 Although the big tyres did need more effort from me; they made it an easier ride over the rough sections of the trail. The last section of the run down to Princeton was over wide-open grassland. Princeton to Tulameen was in a rocky gorge and the track was a much better option than the highway. These guys were just four of a dozen that I met that were doing the whole trail as a self-supported tour. All were on mountain bikes. Rockslide near Collins Gulch. One of three times where I had to unpack the bike and carry my stuff across. Around Tulameen, the track was rough. Mainly due to quad-bike/ATV activity. Loose rocks and stones where the dust had been blown away by fast moving wide tyres. Loose stones on the trail leading to Otter Lake. 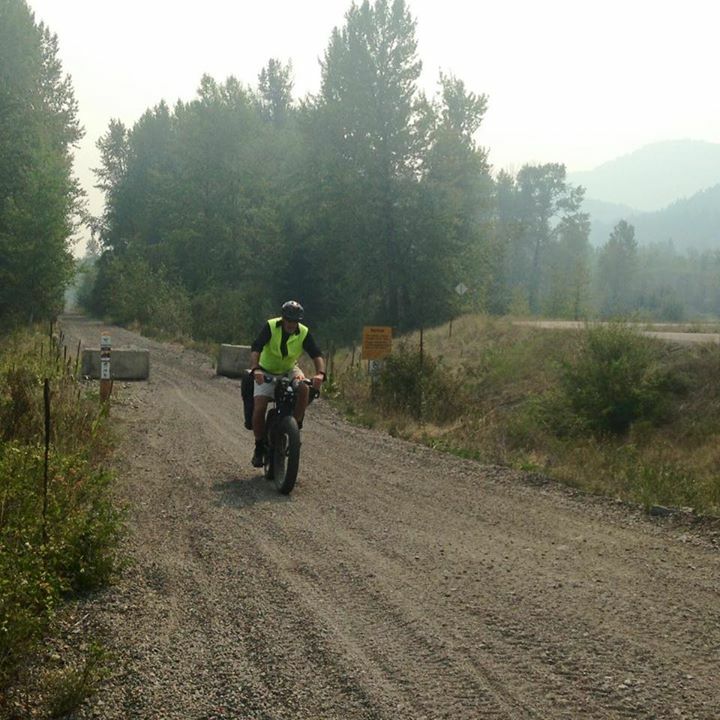 The trail joins the Coquihalla Highway and takes the same route at times on the descent to Hope. Massive landslides in 1949 at the Coquihalla Canyon are the main reason that the KVR closed; although it continued in limited use until 1961. Most of the landslide area can be by-passed by using the service road of a gas pipeline for 22 kilometres. It is gated but part of the Trans Canada Trail and available to hikers, bikers and horses. The Othello Tunnels are the last section of the trail before Hope. Another engineering marvel where the railroad went from tunnel to bridge to tunnel to bridge in the Coquihalla River Gorge. One hundred year hand carved tunnels. Pictures from the 2015 Beausejour Car Show.